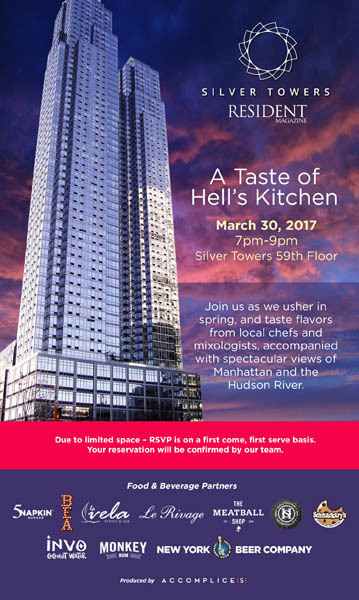 Larry Silverstein was one of the earliest investors in Hell’s Kitchen, and to celebrate the explosive growth of this vibrant neighbourhood he is celebrating “A Taste of Hell’s Kitchen” in the penthouse of the gleaming Silver Towers- the luxurious residential project where this renaissance started. New buildings and restaurants draw new residents, turning the area into a high-end neighborhood. Spring is coming; the flowers are starting to bloom and so is Silver Towers’ latest project. On March 30th, Lisa Silverstein will host an exclusive event to celebrate this flourishing neighborhood. Panoramic views of the Empire State Building and the Hudson River, will top the celebration off. Popular restaurant partners from the neighborhood- 5 Napkin Burger, BEA, La Vela, Le Rivage, The Meatball Shop, Schmackary’s and Southern Hospital will add a culinary touch to Silver Towers’ venture. And lively libations from Invo Coconut Water, Monkey Rum and the New York Beer will keep the party going. The new buildings are just as grand and exclusive as the event. Every detail is taken into account, providing the new residents with an extraordinary residential experience. An overlooked but centrally located neighborhood has turned into one of Manhattan’s most sought after areas to live. Stay tuned for coverage of the upcoming Taste of Hell’s Kitchen that will give further insight into this exciting venture.